I’ve been a little quiet this week… after the 10k I felt a little tired (blurry vision gives it away for me), so on Monday I rested, and then on Tuesday too. Work was busy, but good busy. I’d not been sleeping too well, broken sleep, but that wasn’t the end of the world. Then Wednesday I woke up at 5am, with a run in my mind, I got up and dressed into my running gear. Only to realise that I had a bit of a sore neck… right up at the top of it, on the left side. And sitting waiting to wake up and go my run, it got worse and worse, and I realised I had limited movement and a lot of pain. I got up from my chair to go my run, then realised very quickly there was no way I was running, and went right back to bed for more sleep. After two days of rest, I managed to pull my neck… seemingly in my sleep. I thought back to around this time last year, it might have even been the same week. I was holding assessments at work, like this week, holding assessments at work, and as I was putting a top on (such a dangerous activity!) 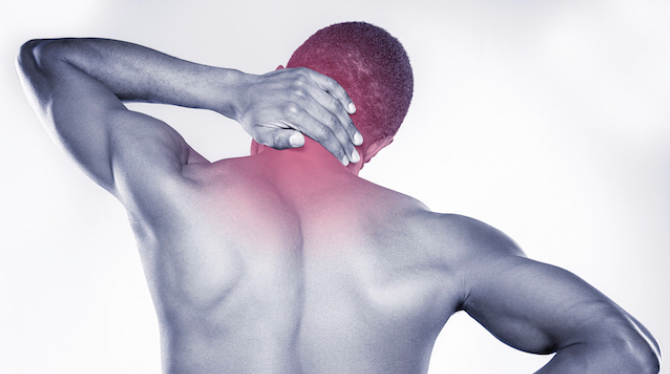 POP… a muscle in my shoulder popped. This one, in my neck this time feels very similar, got through the dangerous act of sleeping! This time there are odd occasions of shooting pains depending on what I do… and I’m best not to use my left arm to do anything or pain can shoot up my neck. I’ve been taking the usual medication and icing it, and lucky for me I was able to get a half hour massage with Lorraine in work yesterday. The sorest ever. Yesterday the pain was so bad I was in tears at points… hopefully time and medication / managing the pain will make it better soon. 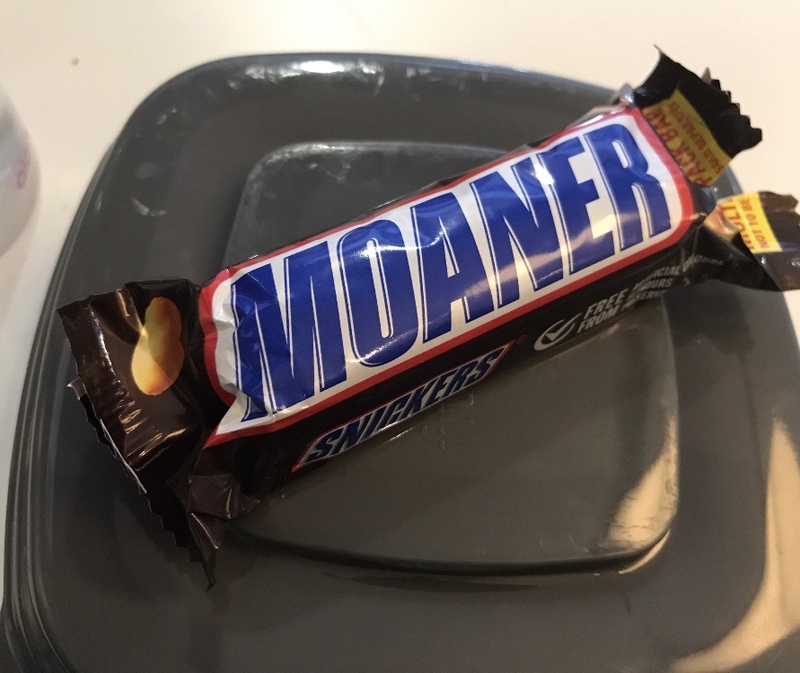 I text my brother and he said MTFU and keep taking the pills – and it just so happened I sat down to my lunch and the snickers above was in my lunch box. Ha ha. Best not to be a moaner eh? So I’ve had to cancel a couple of coaching sessions this week – boooo. And if you see me walking funny like a robot not able to turn my head, you know why. On the bright side, I got this picture message from a colleague this morning. 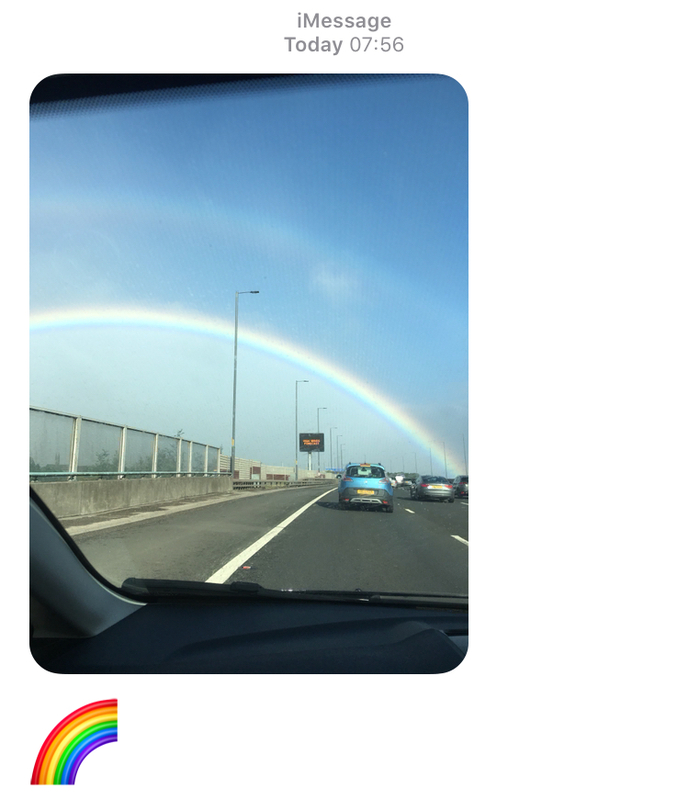 Looks like it’s on the M74… a big bright double rainbow, telling us everything will be fine. So get better and stop moaning.